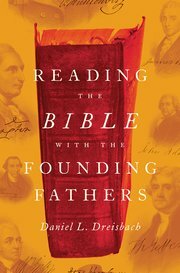 Daniel L. Dreisbach, CSLR Fellow and professor at The American University, has published Reading the Bible with the Founding Fathers (Oxford University Press, 2016), a study of the American founders' use of the Bible in political discourse and an analysis of the diverse uses of the Bible in political rhetoric. The book challenges the belief that the ideas informing the founding fathers were predominantly secular and shows that enlightenment rationalism competed with biblical Christianity in the founders' political thought. "This book can be read in an evening but mined for a lifetime," said CSLR Director John Witte, Jr. "The elegant prose and the enticing topics of liberty, justice, virtue, authority, and faith in the American founding era make it hard to stop reading. But beneath the text, the voluminous notes and quotes are a treasure trove that scholars of many fields will be mining for a very long time." Read more about Dreisbach's book here and here.